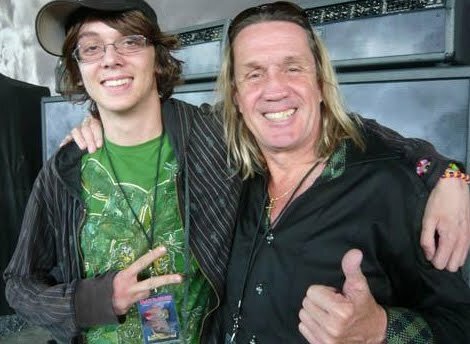 As reported by BocaNewsNow.com, Justin McBrain, the 20-year-old son of the legendary IRON MAIDEN drummer Nicko McBrain, was arrested early yesterday morning for allegedly burglarizing an occupied dwelling and 2nd degree petit theft. He is presently being held at the Palm Beach County Jail on $25,000 bond. A Palm Beach County Sheriff’s Office spokesperson informed BocaNewsNow.com that his deputies responded to a West Boca home after receiving a call that Justin forced his way inside. The female homeowner reported that McBrain knocked repeatedly on the door and then pushed his way in when it was opened. McBrain rifled through the woman’s purse, taking a half-eaten chocolate bunny, half of an orange — which he consumed in the home — a belly ring, cosmetics, and a freezer pack. As previously reported, Nicko McBrain’s wife Rebecca McBrain is due in court on May 3 for she allegedly attempted to stab a man, then threw logs at him at her Boca Raton, Florida home. Rebecca McBrain 50, was arrested on February 24 and charged with battery.